A fire broke out in the depot of the Blonay Chamby heritage railway on 15th December. One goods wagon was completely destroyed and the steepleback locomotive GFM 75 suffered some damage. The parts store was largely gutted with enormous loss of spare parts. Lesser damage also occurred to other vehicles. For more information (and support - this unique heritage line can use it) please see this page of the BC site (in French). 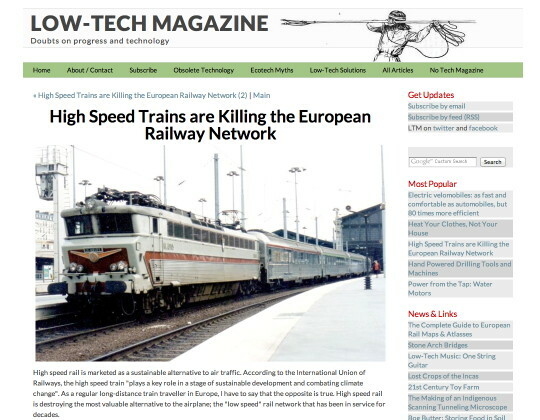 18.12.2013 - Are high speed trains killing the railway network? A thought provoking article that dovetails with some of the remarks I have made on this newslog has appeared in Low Tech Magazine (to article). I don't necessarily concur with all arguments and conclusions made, but the article does make some points of note. Discussions on the Swissrail Yahoogroup have recently turned to the post office railway that once connected the Sihlpost (main post office) to the (now closed) post office 8023 in Hauptbahnhof. A similar line operated in Luzern. Like its longer London counterpart, the Zürich line was narrow gauge and presumably operated automatically. According to the German Wikipedia article on Sihlpost, the line was 340m long and had a gauge of 600mm and ran from 1938 to 1980. The car(s) had a wheelbase of 1600mm and a payload of 250kg. The power supply was by cables located between the tracks. Initially the power supply was three-phase 220V. This was converted to DC in 1958. 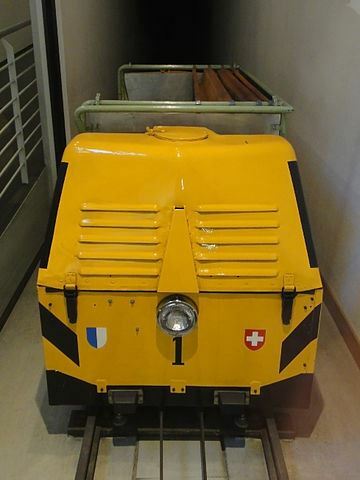 Apparently, one of the cars survives in the Museum for Communication in Bern. The Wikipedia article has a photograph, which I have copied here (copyright Creative Commons, Sandstein). I have no idea why the car carries the Luzern arms. See also my short 2007 contribution on another little know underground narrow gauge line, the EWZ railway. 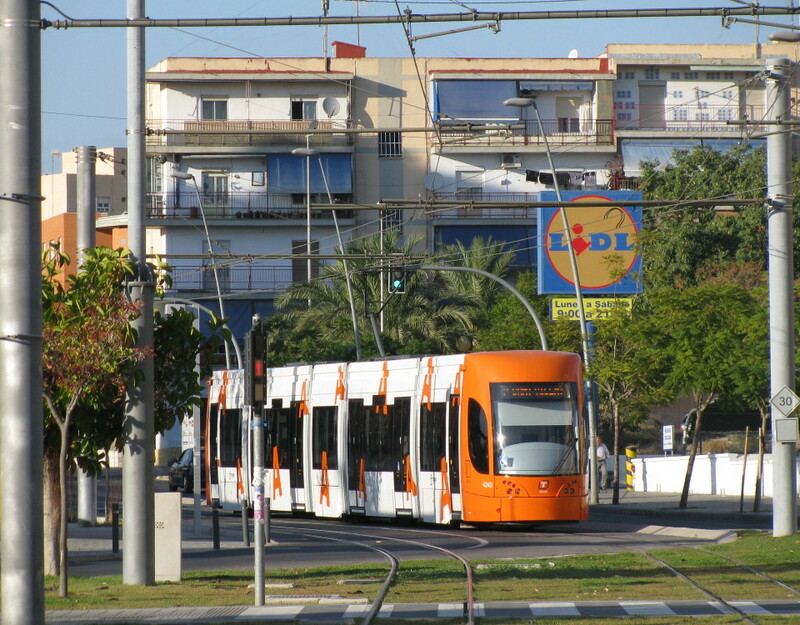 Tram route 17 is being extended to Albisgüetli sharing the tracks of route 13. This will bring a fifth tram route to that segment of Bahnhofstrasse and a third route to Enge - Laubegg (which until 2007 had only a single route). At the same time peak frequencies on route 5 are being increased slightly. On Glattalbahn, all turns of route 10 will now serve the airport, with the off-peak turning of every second tram in Oerlikon being discontinued. The trolleybuses routes on Hardbrücke are being re-arranged with the 33 and 72 exchanging their Morgental / Triemli legs. A new trolleybus route 71 will provide a peak-time relief service between Albisriederplatz and Rosengartenstrasse. A bit off topic, but the 2014 timetable internationally is not just about improvements. A bit of a pet rant maybe, but as a regular traveller to Spain, there is once again a huge depreciation of service. 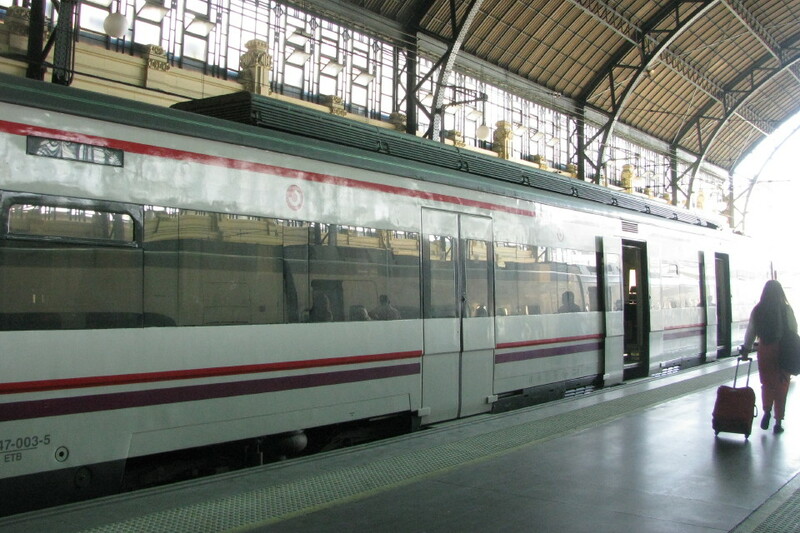 Only a year ago, the comfortable hotel train between Zürich and Barcelona was lost. As a next step, this timetable change is seeing the international gauge-changing Talgos wiped out completely, bringing an entire historical era to a close. 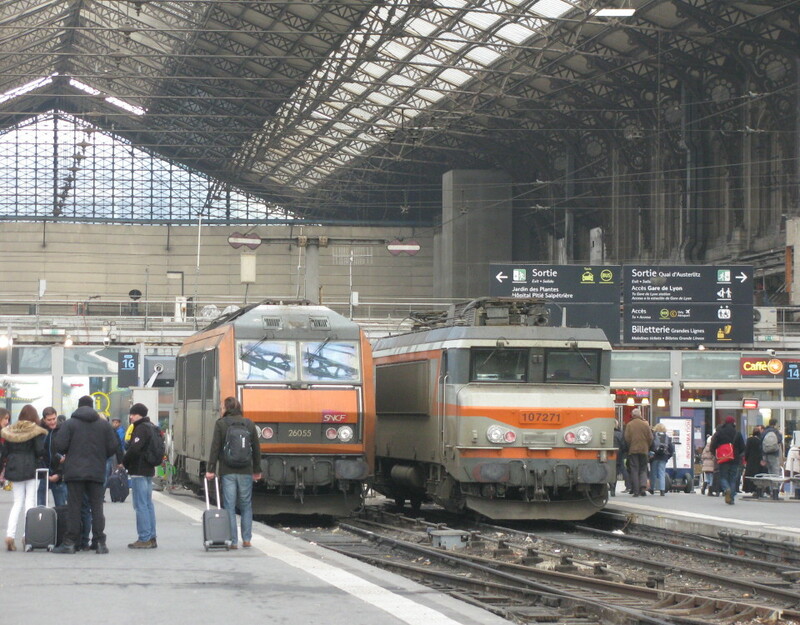 Both the Paris - Barcelona and Paris - Madid Elipsos trains are being discontinued, and the daytime Montpellier - Cartagena Mare Nostrum is being cut back to Barcelona (the other cross-border train, the Catalan Talgo, was discontinued in 2010, although this stopped running to Switzerland much earlier). Furthermore, the Strasbourg to Portbou SNCF night train is also vanishing. All this is justified by the inauguration of direct TGV trains between Barcelona and Paris. No doubt a great step forward for users of that particular route. But at 6 1/2 hours, this is no yet a hop between the cities that will take a huge bite out of airline traffic share, and discontinuing everything that is vaguely parallel is making many connections unnecessarily longer and more torturous. Why not let these servives continue in parallel for a while so the passengers can decide and show what they prefer? What made this discontinuation all the more tragic was that it was largely acheived by stealth, with Elipsos saying until very late that 2014 timetables were not yet available. More great international trains that will be missed. For those determined to still go South by train (a daytime connection to many destinations is still not possible, despite promises of high-speed rail brining Europe together), there are still various domestic French night trains, mostly from Paris (but one from Strasbourg to Avignon and on to Marseille) and some Spanish domestic night trains going South from Barcelona, taht with some clever combination of detours can make for interesting (and doable) travel itineraries. The above photograph, a Talgo train in France, will in two days time be history. This is the Mare Nostrum entering Perpignan, taken only 6 weeks ago. 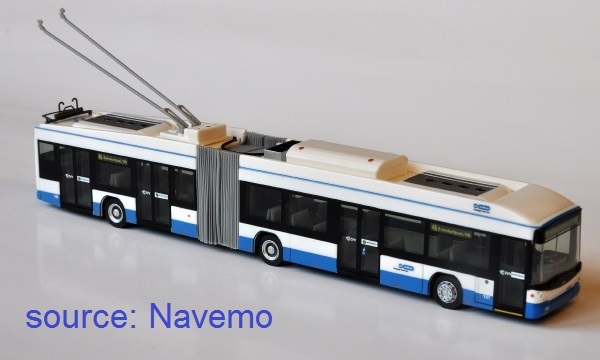 The manufacturer Navemo has long been a good source of HO/HOm scale models of Swiss trams. The manufacturer is now adding trolleybus models by offering Hess's Swisstrolley in both the Zürich and Winterthur variants. Note that this is not just the same model in two livery variants. The Winterthur version sports that city's signature white hubcaps for example. I announced (back in July) that Winterthur was adding a single trolleybus to its fleet. This was based on an announcement on bahnhofplatz.net. Not seeing any other source confirming this, I began to doubt that I had rightly interpreted the news. But the current issue of Tram magazine (11/2013) does confirm this. It would take the fleet to 34 units of which 24 Swisstrolleys and 10 Trollinos. 13.12.2013 - Trolleybus on route 69 by 2016? This newslog has already reported on the nocturnal testing of a double-articulated trolleybus on routes 69 and 80 (well, I didn't mention the 69). A report on this published in the NZZ newspaper on 29th November (and cited on bahnhofplatz.net, states that some adaptations to stops will be required, but nothing major. Gsteigstrasse in Hönng, says the article, is the steepest gradient on VBZ (I guess not counting funiculars). The article also says that electric operation of route 69 is slated for December 2016. There are however presently no plans to use double articulated buses on this route, although they would be used on the 80 for which no electrification date is offered. This is the first I hear of any date for electrification. If it is correct, this is good news indeed. News items so far have emanated some optimism but with baited breath, largely due to lack of commitment from the canton. 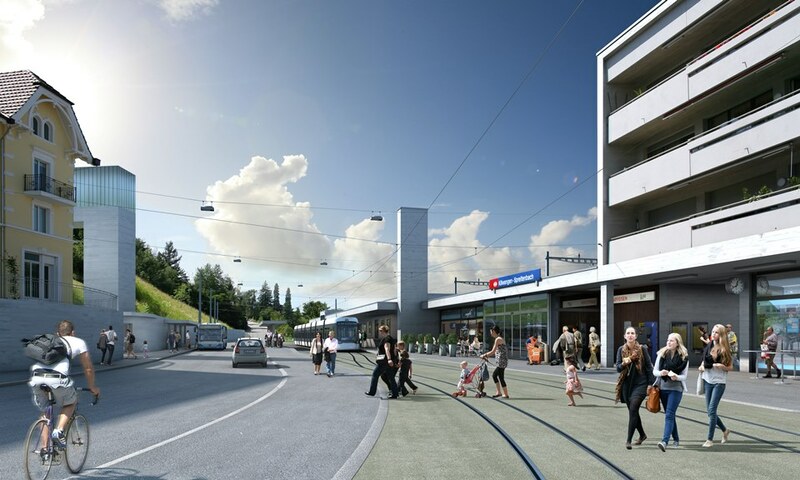 In conjunction with the construction of Limmattalbahn, the city had proposed to re-route tram 2 from its present alignment on Badenerstrasse to share tracks with the proposed Limmattalbahn and so serve the forecourt of Altstetten station directly. The proposed abandonment of the Badenerstrasse section (with the Bachmattstrasse stop) has led to concerns from local residents and traders who fear loss of service and infrastructure in the centre of their neighbourhood. 600 signatures were collected and the city has promised to reconsider its plans. 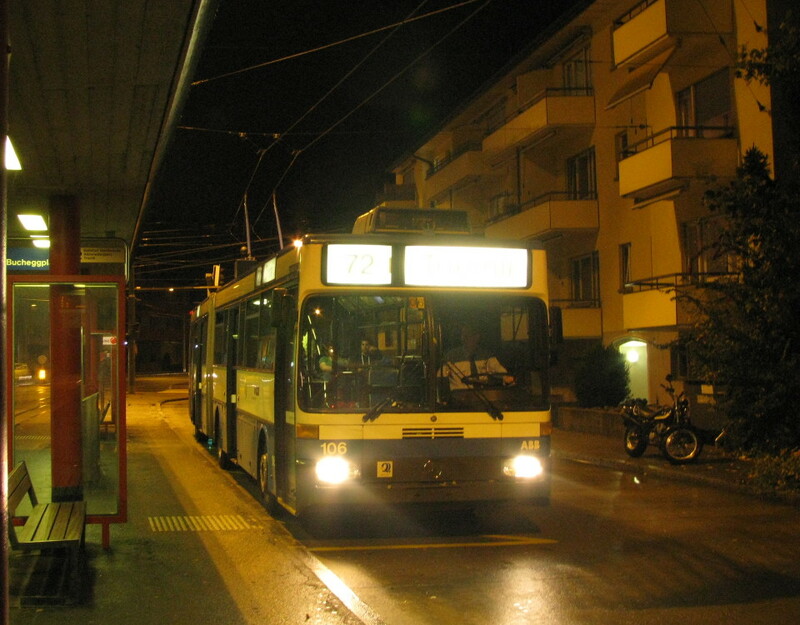 13.12.2013 - TOSA Genève, not a trolleybus replacement? From rumours that I have heard, TPG is not planning to use the TOSA battery bus to replace a trolleybus route, but is instead looking at another deployment. Let us hope that common sense is genuinely prevailing. 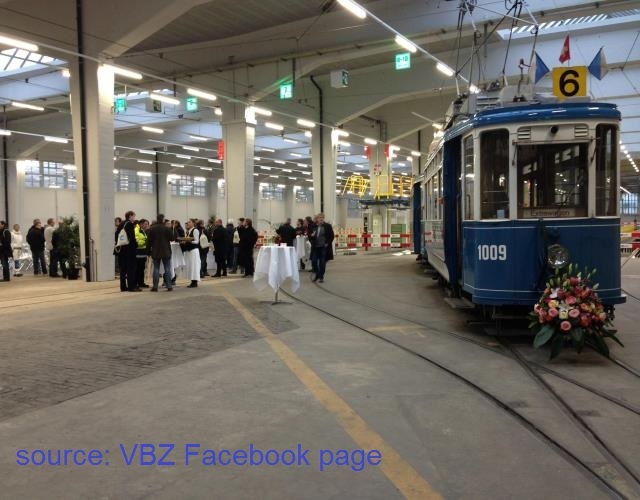 VBZ has celebrated the completion of the renovation of Wollishofen depot. The listed Bauhaus-era building, dating to 1929, now features improved earthquake proofing and solar panels on the roof. This announcement is a bit late, but maybe not too late for readers based locally: This Sunday (1st December), TMZ will run a photo tour with its Pedaler (lightweight Swiss Standard Tram) tram 1530 and four-wheeled trailer 687. The theme will be about revisiting route 22, a peak-only working that ran between between 1952 and 1971. Route 22 connected Farbhof and Seebach via Hauptbahnhof, Stampfenbachplatz and Milchbuck. The tour will also visit other parts of the network. Start is at 10:15 on the Gessnerallee track and finish at circa 14:00 in the tram museum (Burgwies). Costs are 20CHF (10 for children). Registration is not required. The same mailing that brought the above item also contained a newsletter commenting (among other things) on the recent return of Kurbeli 1379 and trailer 737 to Zürich from Paris. This was organized and financed by individuals outside of the official TMZ framework but with TMZ support. The two cars are now in covered storage in an out-of-town location. 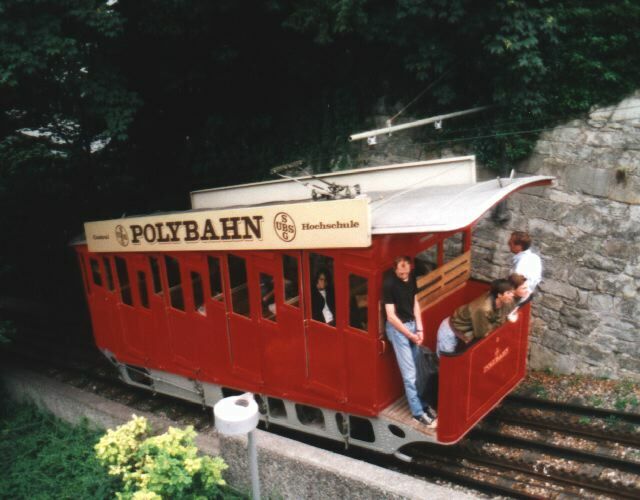 Also discussed is the Polybahn funicular car, last reported in Landquart. It is still owned by TMZ and its visit to Landquart was to determine costs of restoration. These have proved to be too high to permit immediate action. The car remains in safe storage and restoration is a long-term goal. The RhB workshops in Landquart are also preparing a quote for the restoration of ZOS car 81 (which spent its final years as VBZ 1025). Being of the Schnellläufer type, several sister cars remain in Zürich (TMZ's 2 as well as VBZ/APS 1009 and 1019). In contrast to these other survivors, 1025 was orginally built for the private company ZOS (Zürich Oerlikon Seebach). The goal of the restoration is thus to present it in its original guise as ZOS 81 in the company's two-tone green livery (as also displayed on ZOS 1). Another piece of trivia: The car initially had multiple-unit gear permiting a motor unit to be attached to either end of a string of trailers. Being the sole survivor of its batch, reinstatement of this gear is not an option (and apparently it never worked too well anyway), but I understand cosmetic provision is being considered. The above photograph shows two ZOS motor units of this type sandwiching four trailers at Bahnhof Oerlikon. Mercedes/ABB O405 GTZ trolleybuses remaining in service are 106, 113, 115, 122, 124, 129, 131, 137, 140 and 142. Route 80 has been one of the success stories of VBZ's bus department. Originally operated with standard sized buses, these were superceded by articulated buses as the Neoplans were delivered. But demand has continued to grow. The route acts as partial ring, linking significant neighbourhoods such as Oerlikon, Altstetten and Triemli while saving passengers the detour via the city centre. Climbing over several hills, and not devoid of steep, sinuous and challenging sections, trolleybus conversion has been on VBZ's wish list for some time. Sadly, the canton has not shared this enthusiasm and preferred to defer the project to a long-term horizon. VBZ remains deterred however, as shown by recent trials of a double articulated trolleybus (running on battery power and without passengers) to check clearances and determine what, if any, changes will be needed to road layouts. With ridership certain to continue growing as some of the areas served (such as the Hönggerberg university campus) continue to be developed, double-articulated trolleybuses will certainly be the best solution here, and a powerful argument for electrification. I have finally got around to adding some recent photos. - a recent Spanish train trip. 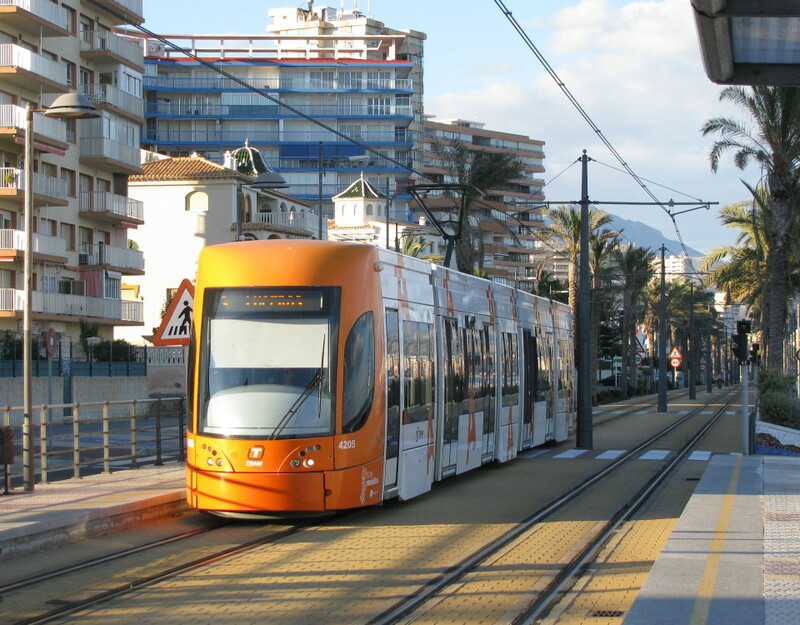 - Alicante trams, with the new line 2. - A snippet of industrial archaeology in Oerlikon. 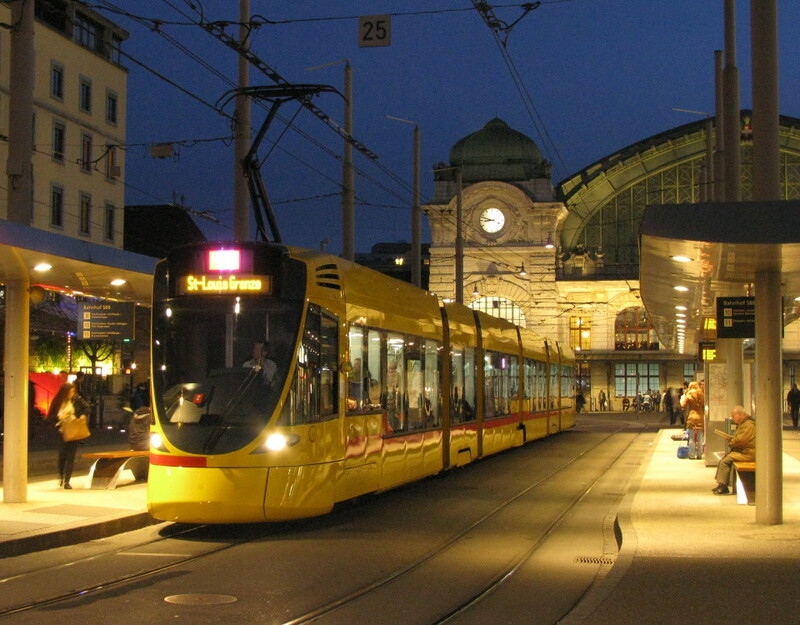 - Tram and trains in Freiburg. This month marks the 10th anniversary of this newslog. 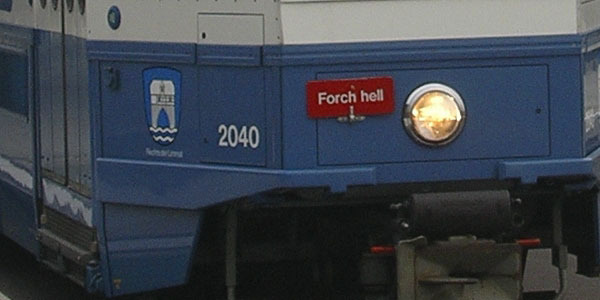 The first two items published (on 12th November 2003) concerned Cargotram and the new Forchbahn units. In total, 957 news items have been published, totalling 108,198 words. The newslog page alone was accessed 103,892 times, moving some 6.3 GB of data. Overall traffic has slipped from 15,673 visits in 2008 to 9,813 to date this year, maybe reflecting that its format has dated somewhat. But quantity is not quality and I do intend to carry on, so please spread the word to anybody who may be interested. And thank you to all readers who have been loyal to this website over the years. With at least four of the VBG Cobras temporarily out of use due to accidents, VBZ is increasingly substituting city liveried Cobras on route 10/12 (operationally these are the same route as cars switch route designation at the airport terminus). The last couple of days, however, have also seen a Sänfte unit on this service. The federal approval for Limmattalbahn has been approved (with surprising speed, as the application was submitted in late September). Construction should begin in 2017, with a first phase being opened in 2019. Following up on the recent Frauenfeld Wil news, FW Be 4/4 11 and 12 have now been sent by road to CJ. 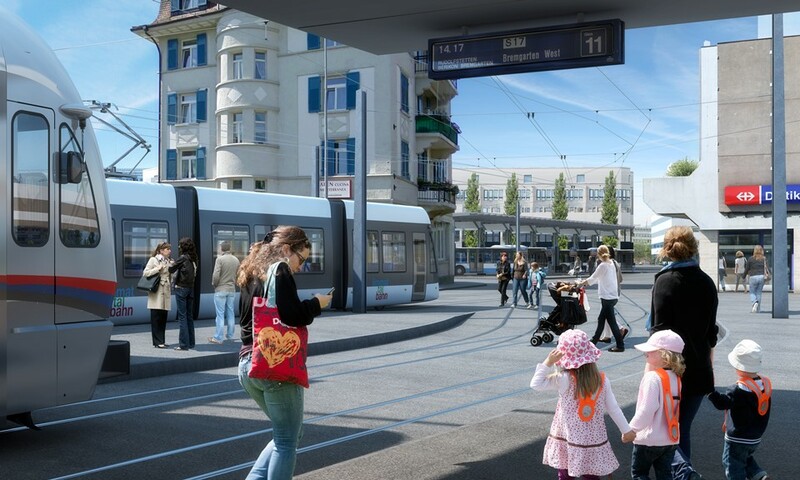 The City and Canton of Zürich have jointly presented their plans for the Rosengarten corridor. Currently the connection between Milchbuck and Hardbrücke is a heavily used road axis of some infamy, also shared by VBZ's trolleybus 72. 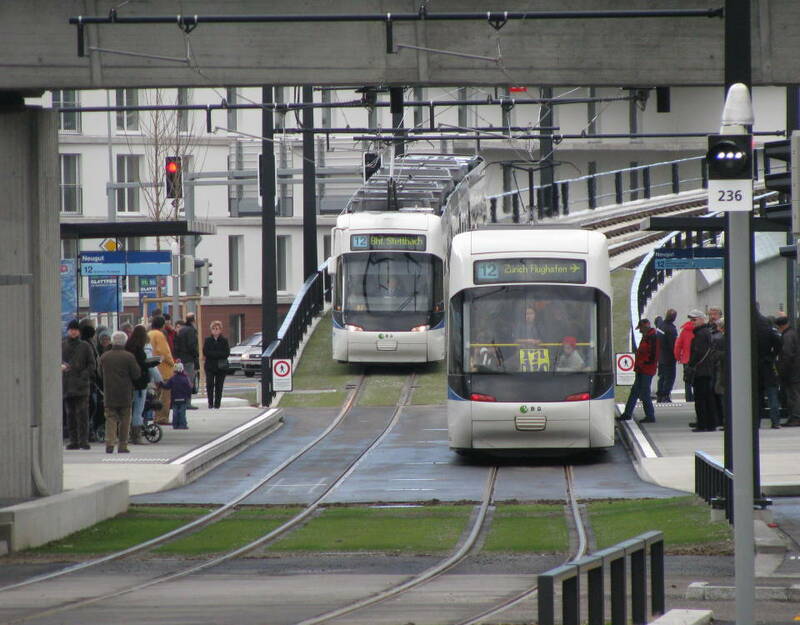 In order to relieve this corridor, VBZ's 2025 strategy (published in 2006) included a tram line along this corridor. This was probably an attempt to break the deadlock between the right-of-centre parties promoting a road tunnel (Waidhaldetunnel) to take pressure off this bottleneck, and the left-wing parties who refused to consider such upgrading of road capacity. The possibility of a tram on the surface might have been understood as an olive branch and made this major new road-building project less bitter to swallow. The more radical parts of the left struck back however by demanding the tram without the tunnel. This was defeated in a referendum in 2010, although at the time the City stated that a vote against this initiative was not a vote against the tram. Living up to their promise, the City and Canton have buried their differences and brought the project back. It now has its own official website: www.rosengarten-zuerich.ch. It again features a road tunnel combined with the removal of all but access traffic (and the proposed tram) from the surface. This restriction of growth in road capacity, combined with the reclaiming of the surface space, opens numerous opportunities in urbanism and favors the further shift away from cars and towards public transport as called for by the Städteinitiative approved by voters in 2011 (although the Rosengarten tram's promoters website speaks of this being in terms of capturing future transport growth rather than breaking into existing usage). 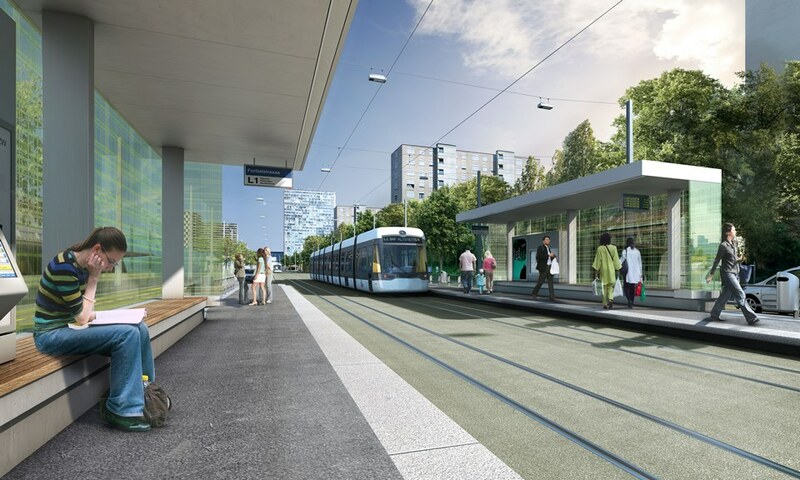 The project is costed at 860 million Francs (of which 220 for the tram, 625 for the road components and 15 for landscaping and urbanist measures) and could open in 2032. Besides its considerable local impact, this tram route has the potential to relieve pressure on the city centre network. It is proposed to route two tram routes on it, connecting Auzelg and Hirzenbach to Altstetten and Laubegg. These routes are presently referred to as RG1 and RG2 (Vision 2025 called them 17 and 18; the rise in priority of Tram Affoltern that has occurred since then has also caused some re-shuffling of northern terminii). On the Frauenfeld-Wil railway (FW), Stadler units 7001 and 7002 are now in service. 7003 is delivered but not currently in service as it is only fitted only with the new signalling system (the old system will cease to be used in mid October, hence the unit cannot run in passenger service before that). Driving Trailers 113 and 114 were taken to a scrapyard on Friday (27th September). ASm are currently in negotiations concerning the purchase of a power car and a driving trailer set for use as a reserve unit at Langenthal. CJ are also negotiating concerning purchase of the other four power cars, but funding for this is not yet confirmed (the volatge will furthermore have to be adapated from 1200 to 1500V). Be 4/4 16 and 17 are expected to be retained by FW as reserve units. With Swisstrolley 182 now in service, delivery of the Swisstrolley4s trolleybuses (162-182) is complete. 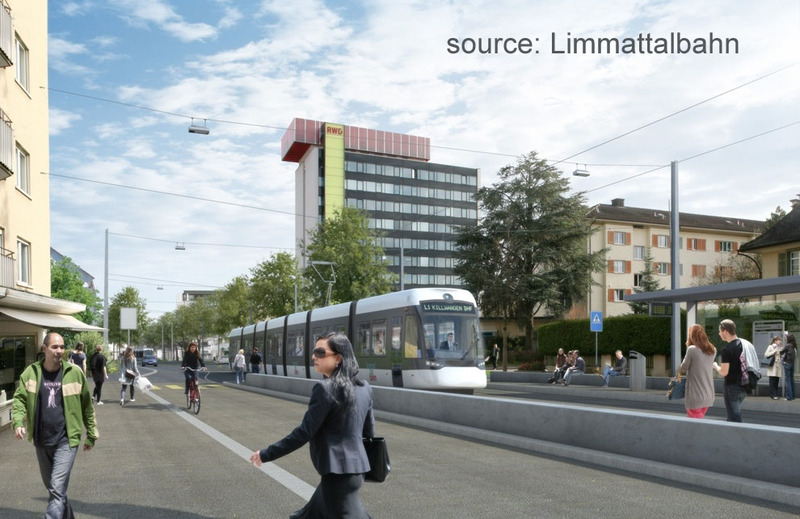 With the cantons of both Zürich and Aargau having approved the Limmattalbahn project, the application has been forwarded to the federal transport department. 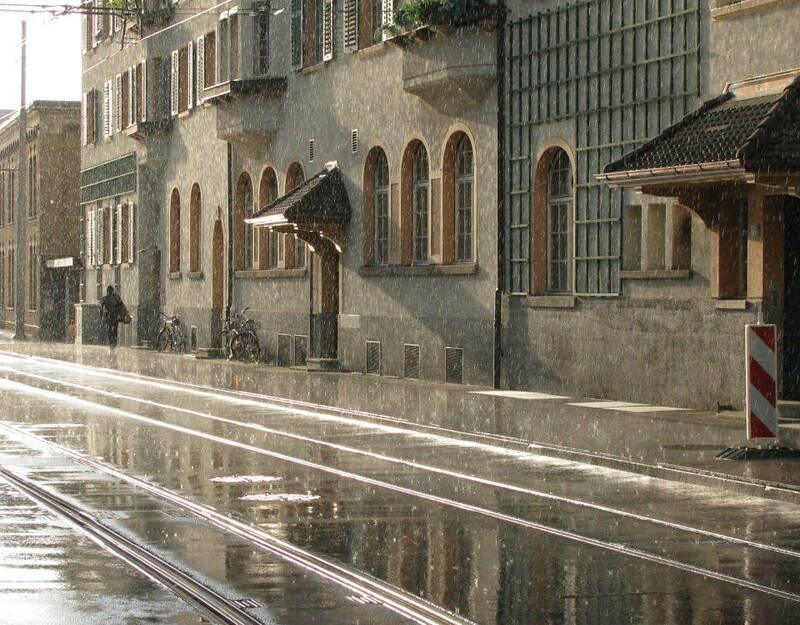 The proposed tram / light-rail corridor will link Zürich's western neighbourhoods (Altstetten) to Killwangen via Schlieren, Urdorf, Dietikon and Spreitenbach broadly following the valley of the Limmat river. The route crosses the cantonal border into Aargau, from where an increasing number of people are commuting into Zürich. If all goes to plan, construction will begin in 2017 with an initial phase opening in 2019. The project will cost 715 million Francs. The line will be 13.4 km long and have 27 stops. 92 percent of the alignment wil be off-street, minimizing conflicts with other traffic. The project will also see many accompanying measures such as improvements to urban streetscapes and cycle paths, adding value to the corridor. The mockup pictures accompanying this newsitem depict (from top to bottom), Furttalstrasse in Spreitenbach, the outer terminus at Killwangen Bahnhof (this is Killwangen Spreitenbach station, which may be known to railway enthusiasts due to its proximity to the Limmattal marshalling yard), Urdorf and finally Dietikon Bahnhof. The latter picture is of special interest as it shows the tracks of Limmattalbahn (from far left) merging with those of the BDWM narrow-gauge railway (from the mid left) for their joint section through Dietikon (pictures can be enlarged through clicking). 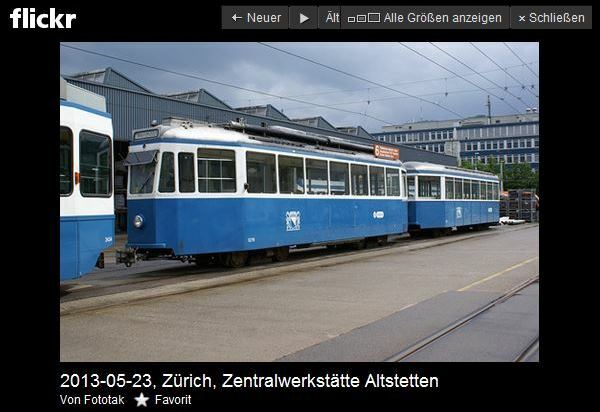 20.09.2013 - Trams for Winterthur? 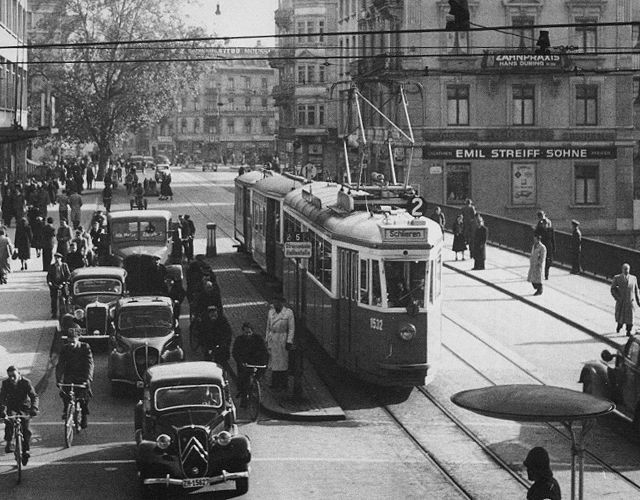 A study by a professor and students at the Winterthur university ZHAW has explored bringing tram back to the town. The 17km, three-line system would require 19 trams. Each line would run at 15 minute headway, with these combining to a 7.5 minute service on the common sections. It is however, unlikely that Winterthur will have a tram before 2030. The study did not look into costs but these could reach around 800 million Francs. 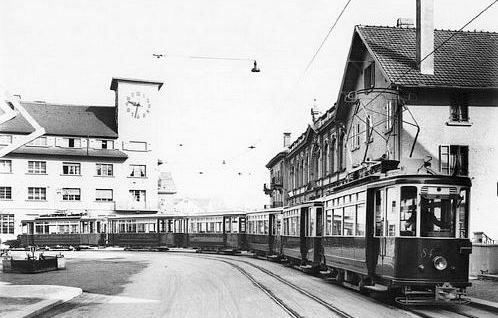 Winterthur had trams from 1898 until 1951. Pland to re-introduce the mode have re-surfaced over the years, either as an urban system (earlier proposal here) or a regional tram-train. Despite the potential realisation being many years away, Prof Häfliger wants the city planners to take notice and consider a future tram in present planning projects. This website previously reported that the last surviving car of the original Polybahn funicular (in service 1889-1996) had left its previous resting place on the forecourt of the tram museum workshop at Wartau and departed for a destination unknown. It has since been sighted outside the RhB workshops at Landquart, where apparently the feasibility of repairs is being evaluated. It is not presently clear who is behind the move or what is planned for this car. 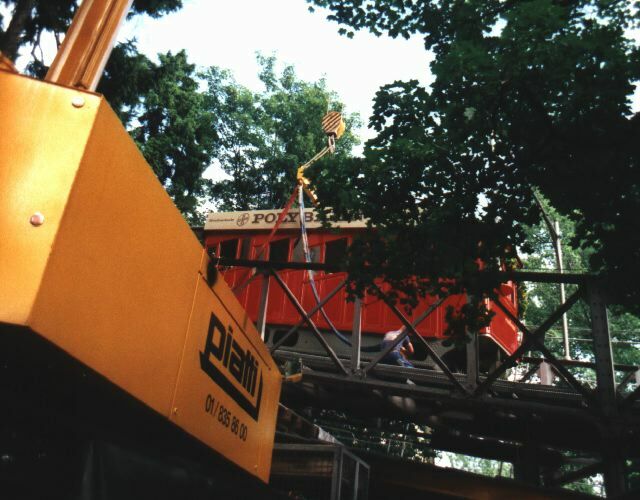 The pictures accompanying this news item were taken during the final days and dismantling of the original Polybahn in 1996. One of the two cars was saved and first displayed outside the Giesserei restaurant in Oerlikon and then later tranferred to CEVI Pfäffikon before being returned to Zürich in 2009. 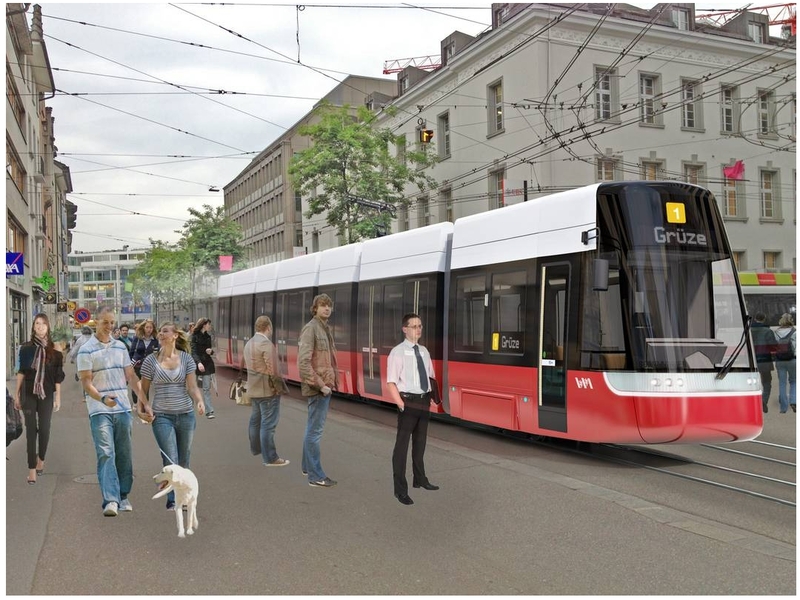 In an article of 6th September, the NZZ newspaper reports on the order for two additional Lightrams for route 31. It also states that some O405 GTZ will remain in service beyond the delivery of the Swisstrolley4s, but limits this to April 2014, explaining that many of the diesels presently filling on trolleybus routes will be needed for other purposes. This would contradict earlier reports that they may remain until the opening of the Hardbrücke Tram link. The O405 GTZ trolleybuses are rapidly becoming an endangered species. 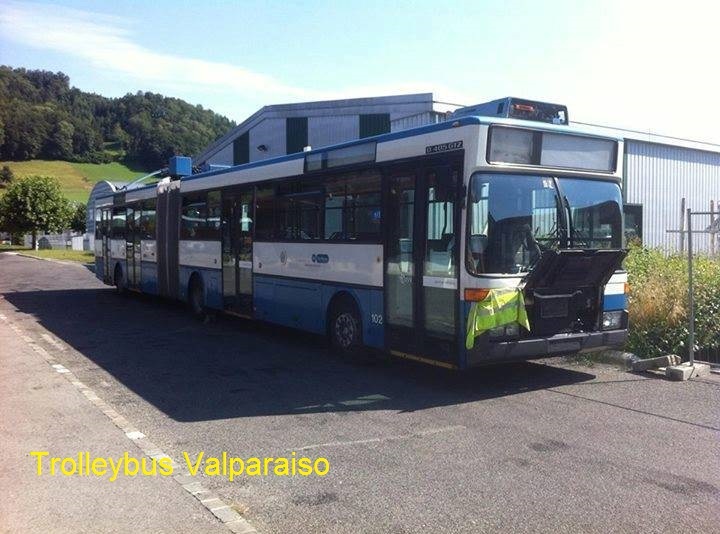 Trolleybus Valparaiso has, on his facebook page, posted these sad pictures of 106 awaiting its fate. 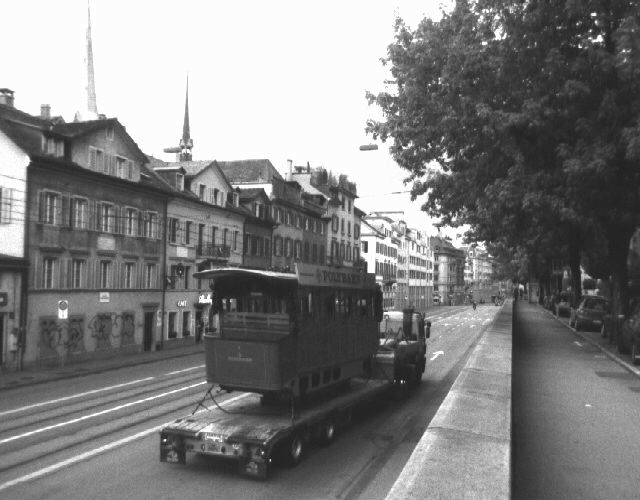 O405 GTZ trolleybus 102 was towed out of Zürich on 17th August for preservation by Rétrobus. This is the third O405 GTZ to be preserved by this organisation following Winterthur 147 and 149. According to bahnhofplatz.net, Kurbeli 1379 and trailer 737 – returned to Zürich from AMTUIR earlier this year – have left for storage at a location in Solothurn on 18th June. Also moved to the same location was crane car 1953 (built 1963, rebuilt 1979). A view of the Swiss Standard Tram set during its brief stay in Zürich can be seen on Flickr, here. The future of these vehicles remains undecided. What a pity that the opportunity was missed to generate more interest and ultimately support during the cars' stay in Zürich, for example by displaying the set alongside 1392 + 732 at the museum in Burgwies and generating more publicity by informing the media or spreading the word on social media. This landmark opportunity has passed practically unnoticed. The former Polybahn car, which previously stood on the forecourt of Wartau depot has also left Zürich, although it is not clear whether it has gone to the same destination. VBZ and ERZ are celebrating 10 years of Cargotram operations. The pilot phase began on 15th April 2003, becoming permanent at the end of the year. The service was gradually expanded from four to nine destinations and a second service, E-tram, added in 2006 to pick up electronic goods. To mark the anniversary, the tram has been repainted into a new livery. For more background information on the service, see this article (written in 2003). VBZ is testing cycle-freindly tram tracks at the Schwert stop of route 13. Past tests have involved rubber inlays in the rail groove but these have proved unsuitable as they would easily become detached from the rail or damaged by use. The new test involves a rail with a deeper groove, so reducing the compression on the rubber. This newslog has already discussed the future deployment of the trolleybus fleet, especially in regard to the new vehicles not being numerically sufficient to replace the current fleet one to one (see posts of October and June). Trolleymotion now sheds some further light on this. Concerning the purchase of two additional double-articulated units, the order placed in 2011 included an option for 10 further Lightram3s, of which these are part. Currently three services on route 31 are scheduled to be worked by single-articulated diesel buses. The new trolleybuses should permit both routes 31 and 32 to be fully electrically worked under normal conditions. As for the single-articulated trolleybus routes (33, 34, 46, 72 and the future relief route 71), the exchange of terminii between routes 33 and 72 as well as the all-day 7.5 minute headway will permit changes as follows: Route 33 will require 12 vehicles (presently 18) and the 72, 10 vehicles (presently 8). 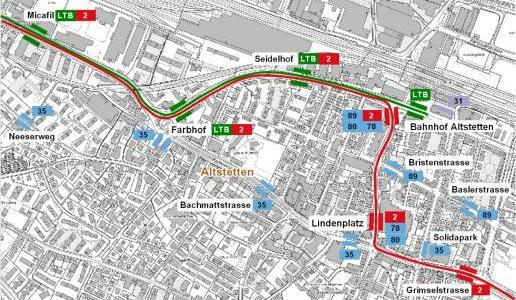 The proposed relief route 71 between Rosengartenstrasse and Albisriederplatz will require three units. The three routes will thus jointly require 25 trolleybuses, down from the present 26 (note, the above numbers do not fully match those here). With the 46 and 34 continuing to require nine and four respectively, the total requirement for single-articulated trolleybuses in service will be 38. Once all the O405 GTzs are replaced, only 39 single-articulted trolleybuses will be available, leaving insufficient units to cover the maintenance reserve. To bridge the gap until the opening of Tram Hardbrücke (which will presumably permit route 71 to be discontinued), a yet to be determined number of O405 GTZs will be retained to cover as spares. Since April, the following GTZs have been withdrawn: 102, 110, 111, 112, 118, 123 and 127. 102 is set aside for preservation by an unidentified party. 15 trolleybuses of this type remain in service. Continuing on the topic of trolleybuses, Trolleymotion reports on the future of the Bern system. With both the network and fleet having shrunk over the years, some observers have expressed concern over the system's future. However, on a more positive note, it does appear that BernMobil is presently seeking to replace the fleet, albeit using battery trolleybuses that would permit overhead lines to be removed from the city centre (and thus permit the trolleybuses to be re-routed from the Marktgasse to the Bundesgasse, overhead lines not being desirable in the latter). The re-route is envisaged for 2018, with a total fleet replacement being planned for 2021. In common with Basel, Bern went through an unsuccesful phase with gas buses. 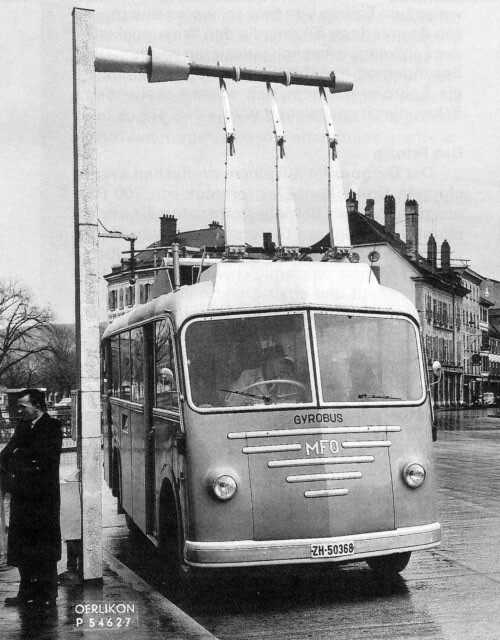 In contrast to Basel however, Bern's trolleybus survived that, with the gas buses being used more as a replacement on diesel routes. First of all apologies for the lengthy break in updating this page. Some of the following items may thus seem slightly old. 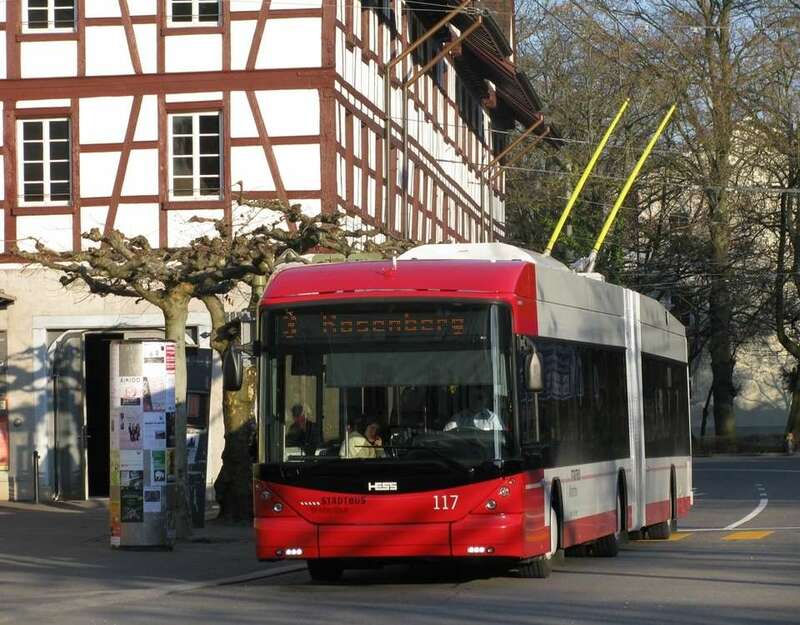 According to bahnhofplatz.net, Winterthur is acquiring an additional trolleybus to strengthen service on route 2. At this time that the trolleybus as a mode seems to be on its back foot, any order for a new trolleybus is good news, especially if it is to grow a fleet rather than replace existing vehicles. In 2011, Winterthur also orderered two trolleybuses, taking the fleet from 31 (before the GTZ replacement) to 34 when the new addition arrives. Back in 2006, VBZ announced their Vision 2025, outlining their development strategy. VBZ has now published a new report, adapting these plans and taking them up to date. The study looks at present and future passenger flows and expected development and studies the changes that will need to be implemented to absorb the growth. With the new cross-city rail tunnel (Durchmesserline) approaching completion, the re-arrangement and additional capacity of S-Bahn routes will bring changes to regional traffic flows and capacity. Many of the new tram lines proposed are the same as in the previous study, but some priorities have shifted. 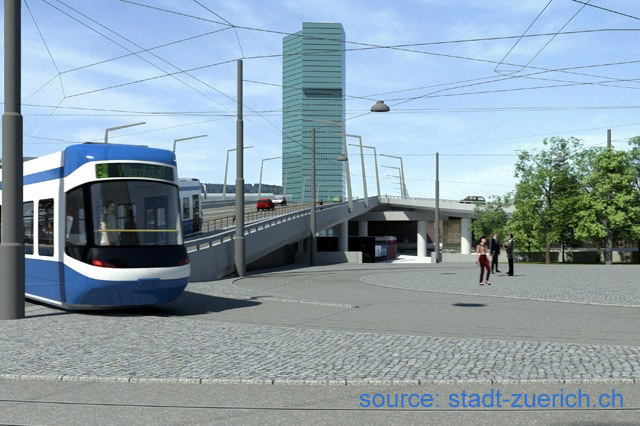 Compared to the 2006 proposals of course, Tram Zürich West has passed from being a project to a working tram line and construction work on Tram Hardbrücke is drawing closer. 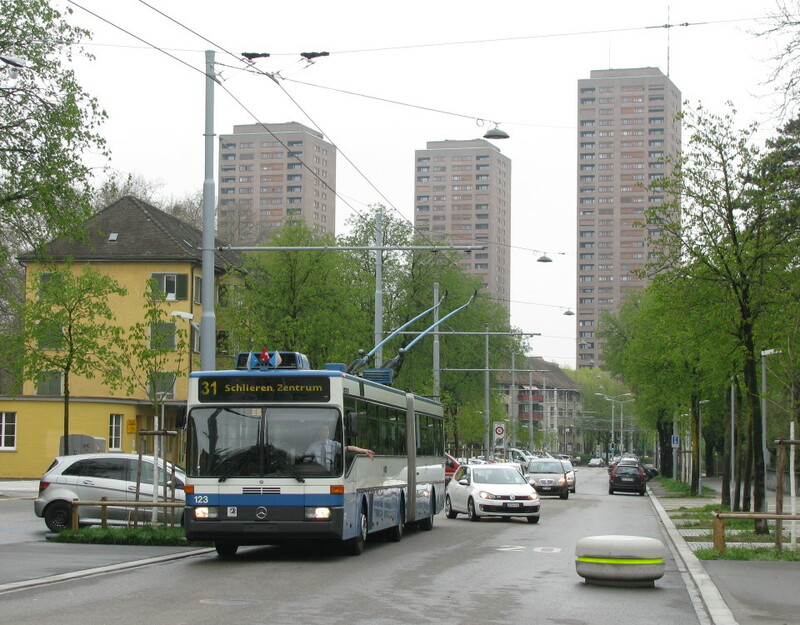 The tram on Rosengartenstrasse (Rosengartentram) and its southern extension (Tramtangente Süd) is still being pursued, but due to political opposition, this looks like a more long-term objective (beyond 2025, but improved trolleybus capacity – such as bus lanes – may happen sooner). 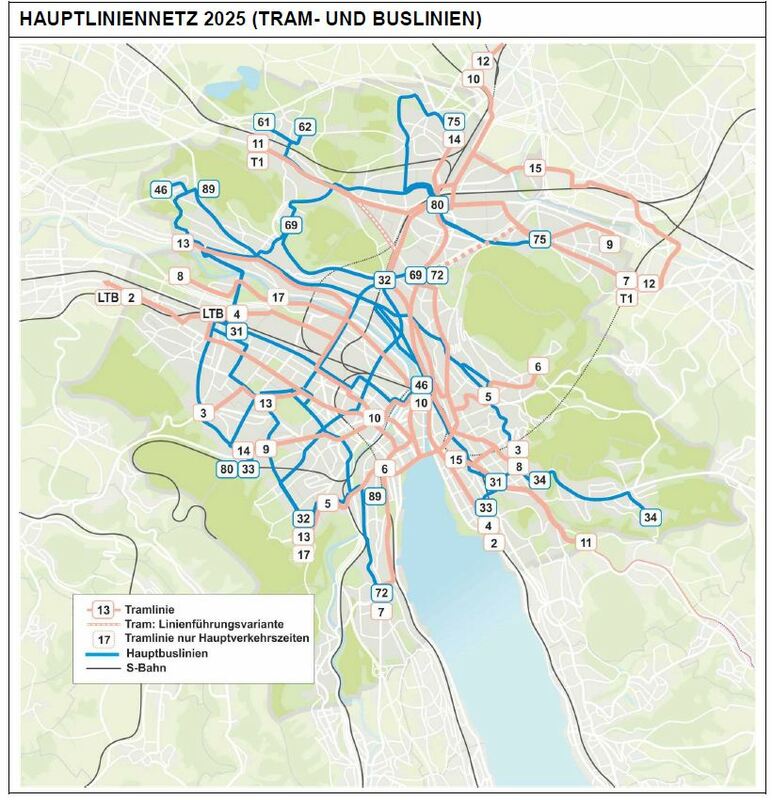 On the other hand, the Affoltern tram line is now a priority – and even appears set to be served by two routes. One tram route is envisaged as a tangential route from Holzerhurd via Bahnhof Oerlikon to Stettbach (resucitating the Oerlikon to Schwamendingen tram proposal at the same time, another one that seemed to have slipped to a very long-term horizon. The route is marked T1 on the map below. It links Holzerhurd to Bahnhof Stettbach via Bahnhof Oerlikon and involves a lot of new track). The other Affoltern route will run from Holzerhurd into central Zürich (probably as a re-routing of route 11, with route 11's present Auzelg leg being taken over by route 15). 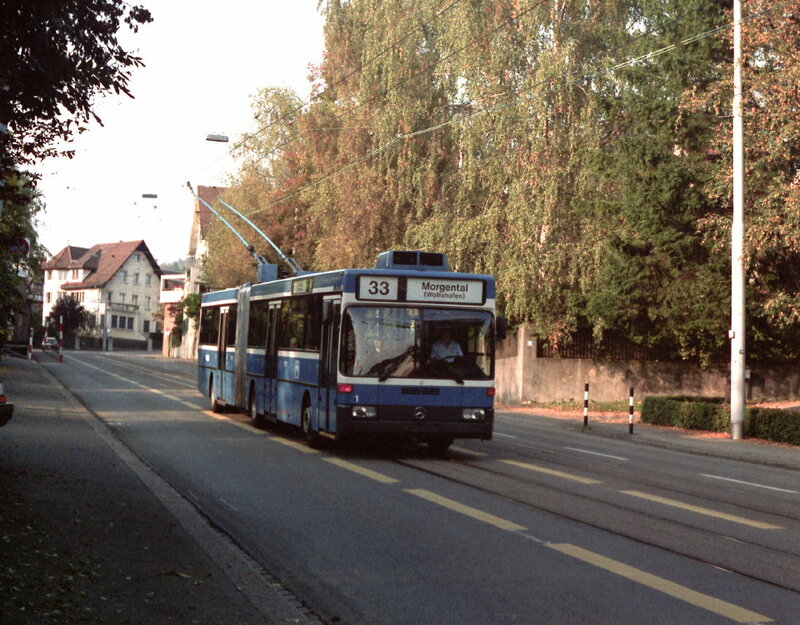 This line could either share tracks with the above route as far as Regensbergbrücke (Oerlikon), or make its own way to Bucheggplatz along much the same alignment trolleybus 32 presently uses. In terms of trolleybus planning, the electrification of routes 69 and 80 are mentioned as goals. Further details are emerging on the future tram layout at Bahnhof Altstetten. When the proposed Limmattalbahn is built, route 2 will be extended beyond its present Farbhof terminus, sharing the new tracks as far as Schlieren. To improve connectivity to S-Bahn services, the present alignment in Badenerstrasse is to diverted to run past the station, and Limmatalbahn will at the same time be provided a terminus here. The arrangement of this permits a future city-wards extension along Hohlstrasse. Following a series of accidents on the airport line, VBG are repainting the front ends of their Cobras to be more visible by increasing their area of white. 12.06.2013 - Limmattalbahn into central Zürich? Various politicians have proposed that the planned Limmattalbahn tramway (which will extend from Zürich Altstetten westwards out of the city proper and along the Limmat valley to Killwangen) be extended at its Zürich end from its present proposed terminus at Bahnhof Altstetten to Hardplatz (for the trams to thence presumably run to a to-be-defined terminus in central Zürich using existing tram tracks). Such through running has a precedent in tram line 10 running through from Glattalbahn to Zürich HB despite the same journey being possible by S-Bahn in a much shorter time. On the one hand passengers prefer journeys not involving a change, and on the other, the tram is still unbeatable for journeys to intermediate points (similarly the present trolleybus 31, which would largely be replaced by an extended Limmattalbahn is extremely well patronised despite running parallel to the much faster S-Bahn, with quite a lot of passengers using it for longer trips rather than just to get to the next S-Bahn station). In the same motion, the clarification of whether city tram services can be extended to Schlieren on the tracks of Limmatalbahn is being required. Again, the loss of trolleybus 31 without an immediate and direct tram replacement would induce an extra change on what is a well patronised route. The motion has been accepted by the cantonal parliament with 112 votes to 57. The administration must now study the proposals. This newslog mostly reports on Zürich's trams and trolleybuses, while mostly sidestepping the topic of diesel buses, presuming them to be of less interest to the international audience. However, as I know that several followers of this newslog also have models of Zürich trams, they may be interested in this model of a truly iconic and classic Zürich bus to embellish their layout or display. The Hochlenker (or Giraff) was designed and built by FBW. In an attempt to improve his view, the driver was sat in an elevated turret approximately half a deck above the passenger level. However, the advantages did not prove themselves under operating conditions, and only 12 were built, being delivered in 1959 and 1960 (239-250 – 239 originally and briefly carried the number 219). FBW failed to sell any outside Zürich. Despite their small number, the buses developed into one of the most iconic Zürich buses of all times. In spite of being slightly impractical, they proved reliable members of the fleet, lasting in VBZ service about 20 years with several subsequently being sold on for further use (some as caravan buses). It is not clear how many survive today, but VBZ was able to buy fully restored 239 back from a preservationist in the 1990s. The bus is currently not operational. 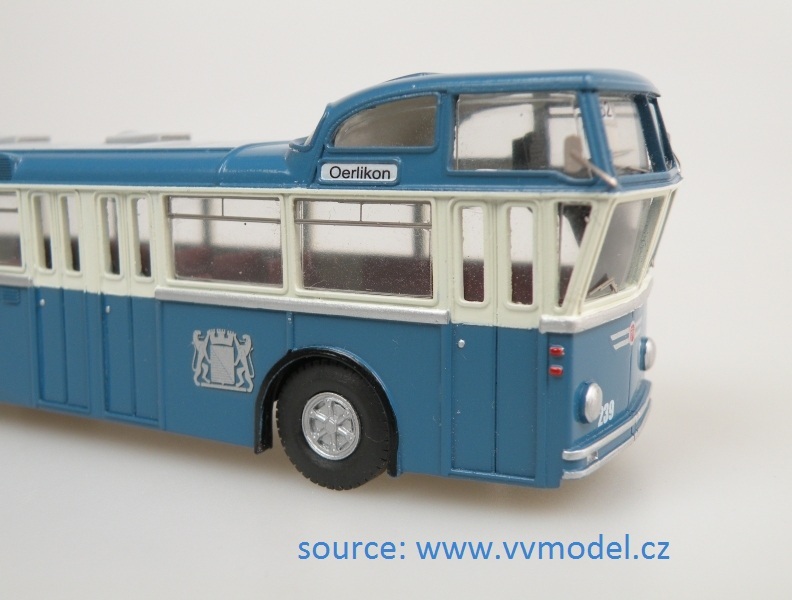 HO scale modellers who would like to include this truly Zürich bus on their layouts can now obtain one from the Czech model maker, www.vvmodel.cz (direct link to product page here). More information on the type can be read on www.ogs-seebach.ch/ p/infoseld.php?src=ogstheme2.php&id=654 . VBZ has ordered two additional Lightram3 double-articulated trolleybuses. The pair is costing 3.6 million and will be delivered in the first half of 2014. The order is being placed with the manufacturer, HESS, on the basis of an option signed with the 2011 order and permitting up to 10 such buses to be ordred by the end of 2016. According to the press release, the two lines using double-articulated trolleybuses, routes 31 and 32, jointly need 28 trolleybuses in service plus three spares. Currently, however, only 29 are available. The new trolleybuses will cover this shortage. Interestingly, the press release presents an explanation of why insufficient vehicles were ordered in 2011. This states that previous plans had intended to cut back route 31 between Schlieren and Farbhof as early as 2014 to permit a rebuilding of the terminus area (Stadtplatz Schlieren). This section of the route would then temporaily be replaced by diesel buses until the opening of the Limmattalbahn tramway. 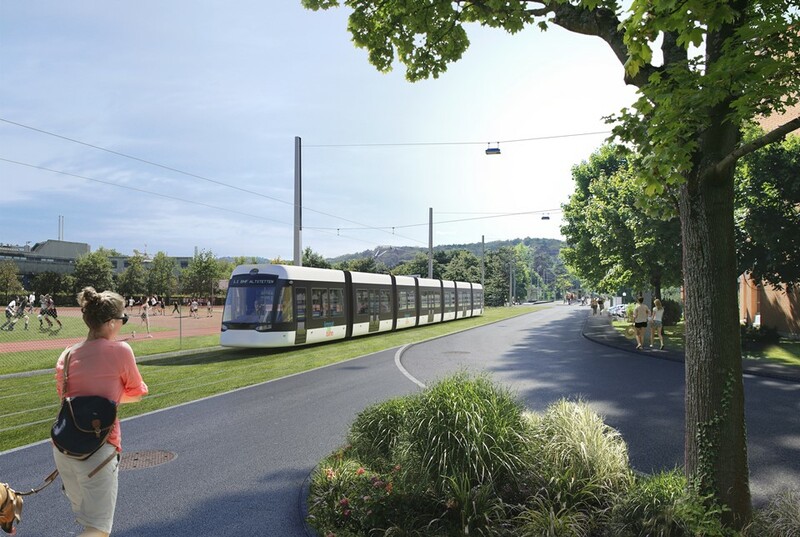 According to present plans, the work is being postponed until 2017, coinciding with the beginning of construction work for the tramway (which will replace the trolleybus West of Bahnhof Altstetten). The cutting back of the terminus of route 31 would reduce vehicle requirements by three trolleybuses. The extended transitional period now justifies the acquisition of new trolleybuses rather than continued diesel operation under wires. The press release states that the buses will be re-deployed elsewhere on the system after closure of the Schlieren section, but does not specify this further. In this way, a premature trolleybus closure, of which the public had (as far as I know) not hitherto been informed, was narrowly averted. Re-running previous calculations with this new data, the present replacement of 43 O405 GTZ trolleybuses by 21 Swisstrolley4s and 14 Lightram3s is reducing the fleet from 78 to 70 units. Four of the reductions are explained by a stretching of headways on route 32, made possible by the increased capacity of the buses. The other four reductions (affecting single-articulated routes) will be covered by increased used of diesel buses under wires, and is also partially justified by the proposed tram line on Hardbrücke, although the reasoning here too remains questionable, as in its initial form, route 8 will not significantly replace much trolleybus traffic. Let us hope for a change of heart on this issue also. BLT has placed an order for a second batch of Tango trams from Stadler. The order comprises 19 units to be delivered 2014-2016. The 2006 plan enivsaged 21 units to be acquired in this phase. The reason for the discrepancy is unclear. Recent O405 GTZ withdrawals (since the April update) include 102, 111 and 123. Swisstrolley4 deliveries have reached number 172. From 1982 to 2005, Seattle ran a historic streetcar line along its waterfront. The suspension was temporary at first, but present plans to redevelop the waterfront no longer include the streetcar. To learn more about this tragic development, and sign a petition to bring the streetcar back, please click on the screenshot below. Every signature counts. The publisher, Atlas Verlag, is offering this HO scale model of Bern's steam tram for the suspiciosly low price of 6.90 CHF. A careful reading of the small print is recommended before signing up for more than you were expecting, as it appears to be an introductory offer for a bigger selling scheme. However, in the modelling forums, the model has received surprisingly positive echoes. The offer can be found on this page of Atlas' website. I am not in any way connected to Atlas Verlag or anybody else involved in this offer. As indicated, I recommend a careful reading of the small print. Discussions of the model (with further pictures) can be found on HAG Forum and Jans Modellstrassenbahnen. 14.05.2013 - Glattalbahn to Uster? There is certainly no shortage of ideas to extend Glattalbahn. 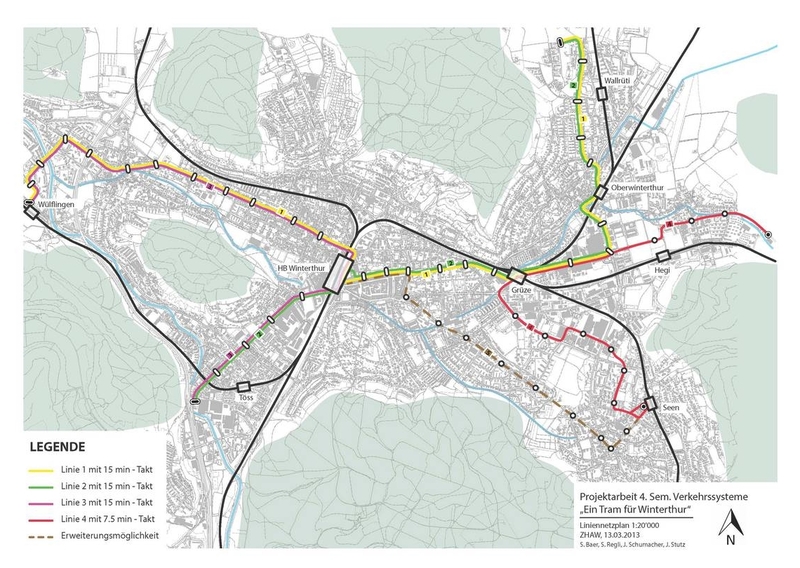 Besides Ringbahn Hardwald (which will probably be realised in phases) and the rather more speculative proposal to take it to Bülach, there is now a proposal to extend it from Dübendorf to Uster. With 89 votes to 74, the cantonal parliament has agreed to reserve an alignment. In real terms this decision means very little though, and the project is to be seen in terms of a long-term horizon. A possible development of Dübendorf's airfield may change this, but the future of this is still open. One rather significant item which I regret to have missed is the return of Kurbeli tram 1379. Discounting the works cars and those sold to North Korea, only three trams of this type (the Zürich heavyweight version of the Swiss Standard Tram) survive. In the mid 1990s, 1379 was saved together with trailer 737 by the French preservation group AMTUIR. Ths association is regretably in the process of reducing its collection due to lack of space. 1379 and 737 arrived in Zürich on 15th February. 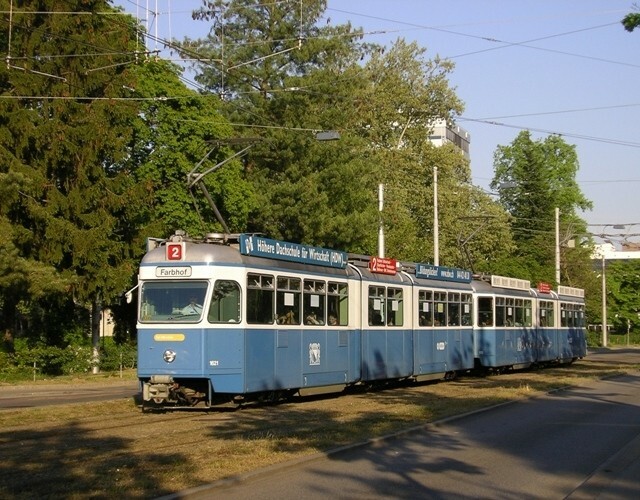 A small group of individuals is behind their return, with some non-financial support from Tram Museum Züich, but not officially as one of their projects. The cars are said to be in good condition, no doubt due to their indoor storage. They will be stored in a safe location. Their future use is undecided. Work on Basel's cross-border line to Weil (Germany) is making good progress. 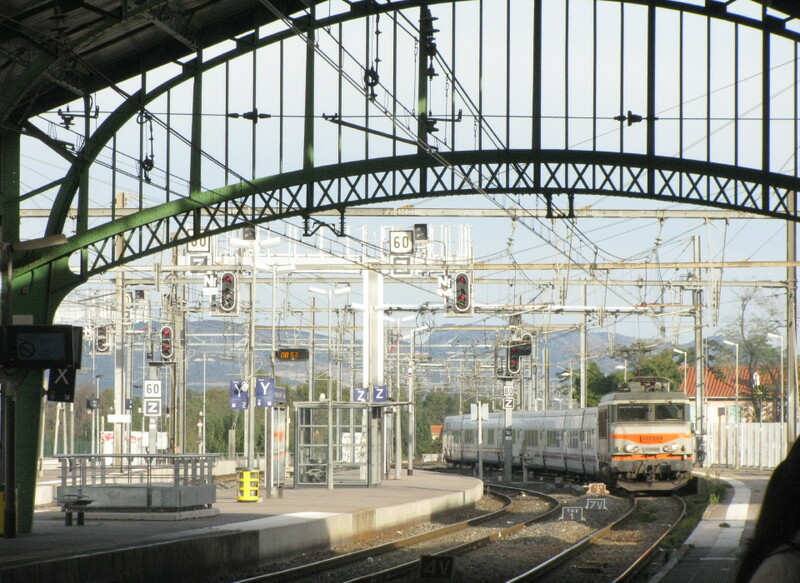 Plans to extend lines to Saint Louis (France) are in the meantime also gathering momentum. The French authorities would like to begin work on extending route 3 this year (or at the lastest next year) in order to be able to make use of money from the French state. The project will cost 98 million Francs and could be completed in 2018. Delivery of Swisstrolley4 trolleybuses is progressing rapidly, with number 170 being reported in service. 24.04.2013 - Living in a tram depot? Modernisation plans for Hard (Escher-Wyss) tram depot include new appartments being built above the tracks. Part of the depot is a listed building (and already has integrated appartements), but the rear part will be demolished and replaced by a new structure. The tram depot occupies a prime piece of real estate, facing the Limmat river and in an up-and-coming highly sough after area in Zürich. However its strategic location means VBZ cannot relocate it. As long ago 1989 the city already proposed a similar redevelopment, but this (and subsequent attempts) never came to fruition. TMZ organised a farewell tour for the ABB / Mercedes O405 GTZ trolleybus on Sunday (21st). This is not actually the final end of operation of the type (they are expected to last until Autumn), but with their numbers rapidly thinning, it may have been the last opportunity to see large numbers in service. The tour was worked by 123 and 140, with several chance meetings occurring with sister units covering normal service. As an ominous sign of the approaching end, 123 failed with a pneumatic problem at Witikon, and 140 had to proceed alone – but the failed bus could be repaired and rejoined the group later. My photographs of the tour can be seen here. I have also added a YouTube movie below. In addition to the trolleybus pictures (above), I have uploaded a small selection of tram pictures: Alicante and Basel at night. Google today has another rail-related doodle. This time Google (in India) marks the 160th anniversary of that country's first passenger train. 10.04.2013 - Skoda 15T for Zürich? 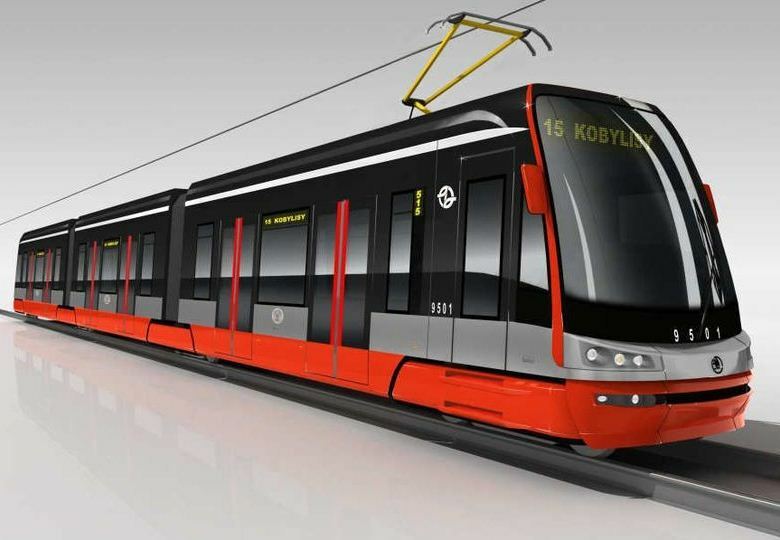 A correspondent has suggested that the fifth manufacturer submitting a tender for Zürich's new trams may be Skoda with its 15T. The first Swisstrolley4s are now in service, with 164 and 165 being reported. 168 has been seen on test. Five suppliers have submitted bids to supply Züich's new trams (the deadline passed at the end of last week). Although the hopefuls are not named officially, the list must definitely include Siemens, Bombardier and Stadler. Alstom says it has not made an offer. My own guess is that the other two suppliers are CAF and one eastern European supplier (maybe PESA?). The final order should be placed before Christmas, with the first of the new trams being in service befor the end of 2016. Genève is to host this year's UIP conference (26th-30th May), and so there will no doubt be a lot of positive talk about how to get more people onto public transport and how to make it cleaner and more effective. Operating during the event and for some time beyond is a battery-powered electric bus, which will operate between the airport and Palexpo. The bus is being presented by TOSA, a joint venture of Genève's public transport operator TPG (T), Office de Promotion des Industries et des Technologies (O), Services Industriels de Genève (S) and ABB Sécheron (A). The vehicle will be will be a 19m Hess-built articulated bus with two powered axles and 40kWh of energy storage. Fast charging stations will be located at both end points, with a charging power of 400kW supplied for 15s. The distance covered will be 1824m in 3 minutes and 20 seconds. It is interesting to bounce some orders of magnitude around and recall that back in 1950, the Gyrobus could cover 5 to 6km for 2 to 5 minutes of charging. A longer demonstration route will be operated in 2014 (route 5 extending from here into central Genève), with recharging at numerous intermediate points (see this TOSA presentation). Reducing polluting emissions by using renewable energy as much as possible (the electric power purchased by tpg is certified 100% hydro) and putting an end to the visual pollution of overhead trolleybus wires are also priorities. 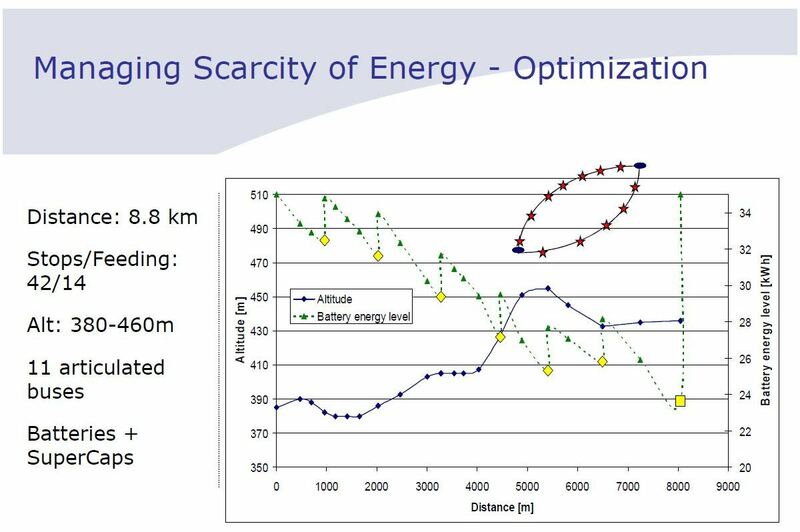 Boosting commercial speed by improving reliability is another. At present, the complexity of the network of overhead wires -serving both trams and trolleybuses - is a source of technical hitches and serious breakdowns. There is nothing to be said against seeking and implementing new propulsion modes for buses, but seeking to set these against trolleybuses and trams rather than the main source of pollution and ugliness in cities – cars, is a worrying development. Only yesterday this newslog praised VBZ's baby trolleybus ad. Dismantling a perfectly good system for a possibly slightly better (or not) one while diverting attention from the real challenge cannot be the solution here. Let us remember that one of the often praised advantages of trams and trolleybuses are the fixed infrastructure. This 'visual pollution' is a sign of permanence and urban civility that inspires confidence and hence encourages people and businesses to plan around its usage. Making predictions of the future is a risky business, which it is why so easy to laugh at predictions of decades past. But neither must we allow misguided nostalgia to stand in the way of the necessary. For the system of the future to establish itself, it needs to be tested and demonstrated somewhere. But why, of all applications, must the demonstration be at the cost of a trolleybus route? Visit this website's trolleybus pages. The first of Frauenfeld - Wil's new Diamant trains has been delivered. This Easter weekend (30th-31st March) will see Mirage trams operate as a coupled pair for the first time since preservation, running on the museum line (Burgwies - Hauptbahnhof). 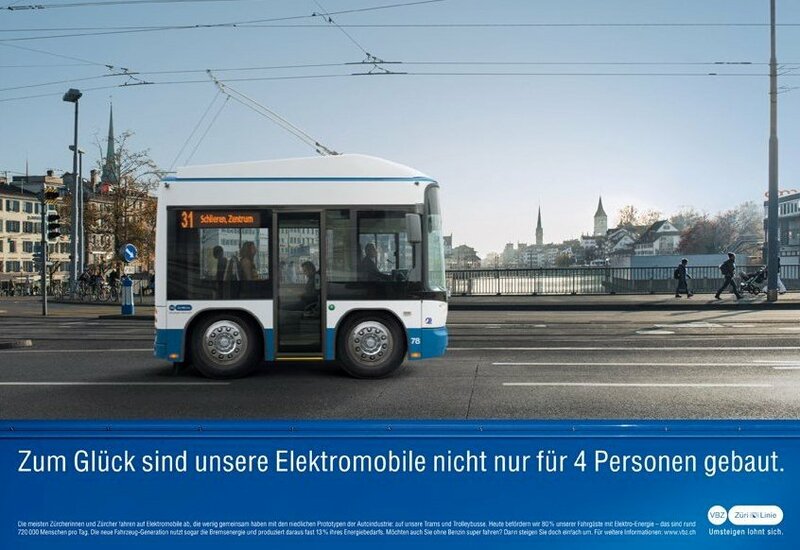 The appearance of Zürich's trams and trolleybuses in adverts for all sorts of products and services happens so frequently that it isn't usually worthy of much mention. But I recently observed two that maybe merited a bit more. Allow me to start with this sympathetic trolley-minibus, which is of course a nudge to VBZ's pride about its super-length double-articulated trolleybus, but also a retort to automobile makers latest craze about electric mobility – something that public transport does much better and has been doing for far longer (but would automobile makers ever acknowledge that?). Yet somehow I wouldn't mind having this toy-like almost cuddly vehicle for real. Maybe not on the 31 to Schlieren Zentrum but on one of VBZ's minibus routes maybe? Another advert that made me smile is this charming view of a Cobra tram in a cardboard cut-out world crossing Münsterbrücke (which appears to have lakewards to become Quaibrücke). 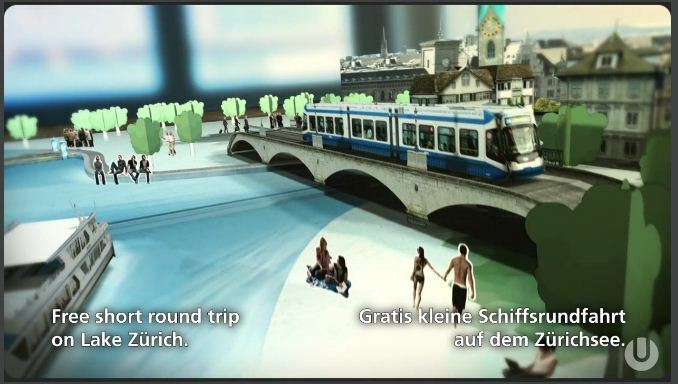 The scene is from a video advertising Zürichcard, an offer for tourists (and residents) combining free travel in the city with free entrance to musea and various other interesting offers. The movie was made by Ultra, and can be viewed on their website here. Stills from the movie are also used as posters. 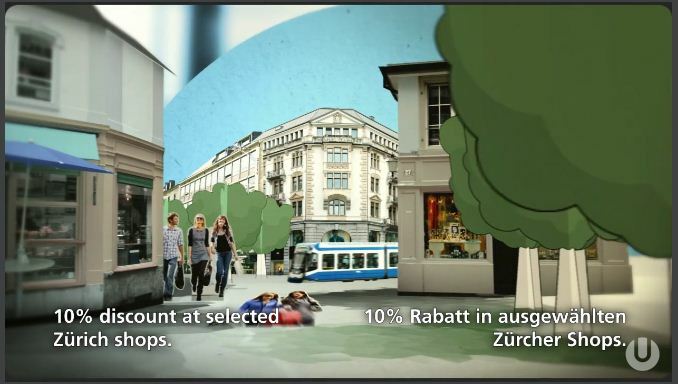 For more information on Zürichcard, visit the Zürichcard website. Incidentally, the Münsterbrücke did carry trams for a while, first horse trams and later an electric line, but the link was dismantled in the 1920s. The movie also has other scenes with trams in similarly composite locations, where you think you know the precise spot until you take a closer look. 18.03.2013 - Tram route 17 to be extended to Albisgütli? 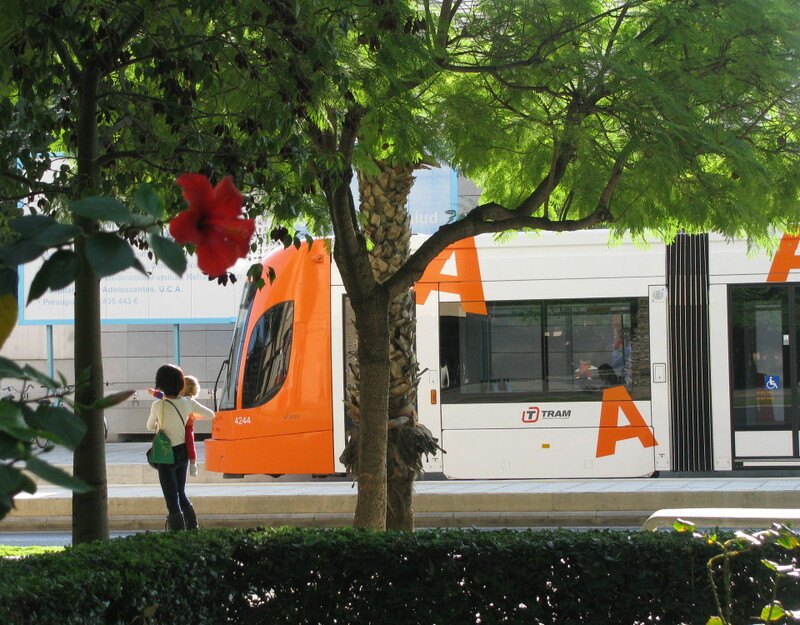 Further news on the December 2013 timetable switch suggests route 17 will be extended to Albisgütli (via Paradeplatz) at peak times. 15.03.2013 - Trolleybuses to be re-routed? 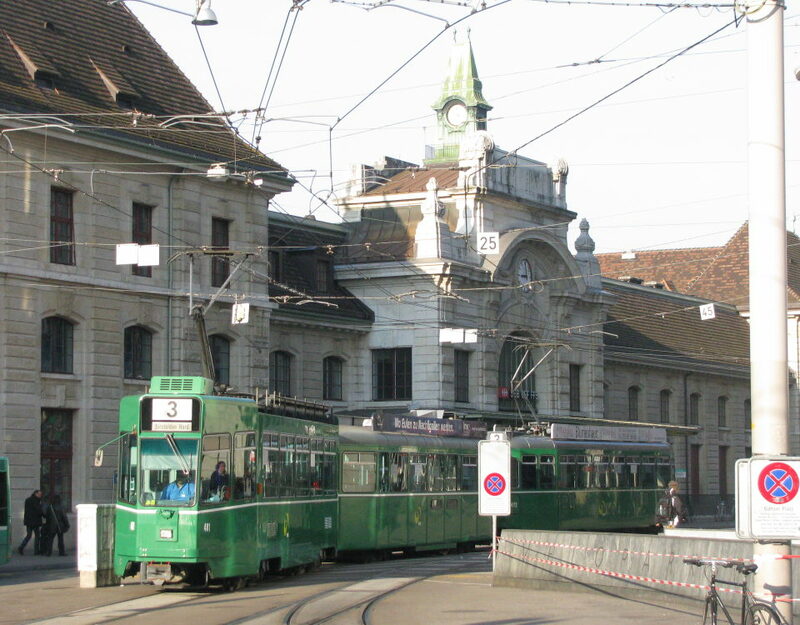 According to bahnhofplatz.net, VBZ is considering exchanging the south-western arms of trolleybus routes 33 and 72. The 33 would thus run Triemli - Tiefenbrunnen and the 72 Morgental - Milchbuck. The change, which could come into effect with the timetable switch of December 2013, is motivated by capacity and timekeeping issues due to the great length of the present route 33. Furthermore a short relief route 71 would be added, paralleling the 33 and 72 between Albisriederplatz and Rosengartenstrasse. 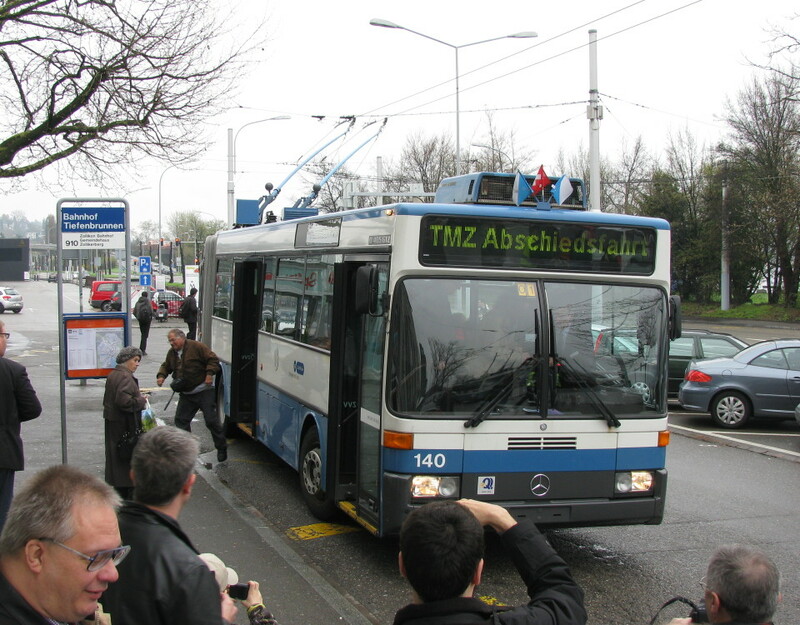 Swisstrolley4 trolleybuses 162, 163 and 164 are reported in Zürich, with 162 having been sighted on test runs. Time is clearly running running out for Switzerland's Mercedes O405 trolleybuses: Bahnhofplatz reports that the last two Winterthur vehicles, 147 and 149, have been passed to Retrobus, although the Retrobus website does not as yet refer to the acquisition. 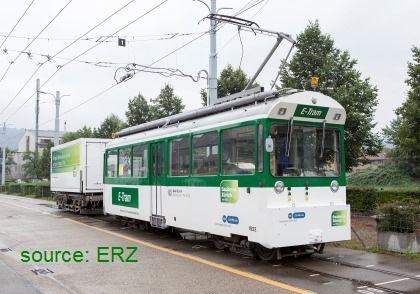 Trolleymotion reports that Zürich's fleet has now also dwindled to 24 units (102, 106, 110-111, 113, 115, 118, 119, 122-125, 127-133, 136-137, 140, 142-143). With the end of these units only months away, we may soon have to look across the Atlantic (and half way around the globe) to see the star of the O405 continue to shine. Quito (Ecuador) has a fleet of O405 trolleybuses by Mercedes-Benz / Adtranz / Hispano. These are equipped to serve high platforms on dedicated busways, but also share with general traffic in the city centre. According to an article on Trolleymotion, the earlier batch (1-54) have reached the end of their economic lifespan. No decision has yet been made about whether they will be replaced by new trolleybuses or by diesels. Delivered in 1995, they are of similar age to Zürich's present O405s (also being withdrawn). Quito also has newer units (55-113) of 1999. The possibility of refurbishing these is presently being evaluated, with 102 being treated as a pilot. This webiste has already pointed out that once the new Swisstrolley4s and Lighttrams are all available, that they will notz be sufficient numerically to replace the O405s 1 to 1. In an earlier posting on this matter, based on discussions on the bahnhofplatz.net forum, the difference was on the one hand explained by stretching of headways due to larger buses on route 32, and on the other by the increased use of diesels as spares vehicles for trolleybus routes, justified by the universal deployment of said spare vehicles. An article on trolleymotion has a slightly different interpretation of this, with expansion of the tram system partially replacing trolleybuses. The article mentions Limmattalbahn, which would see route 31 truncated at Bahnhof Altstetten, and also the tram on Hardbrücke. In the case of Hardbrücke, it is difficult to follow this as although the new tram will parallel the present trolleybus routes 33 and 72 for a distance of four stops, are more long-distance orbital routes and would be likely to survive the opening of this tram. The Rosengarten tram project, which could indeed replace much of route 72, seems to be slipping to a more distant future, maybe beyond the lifespan of much of the present trolleybus fleet, making a proactive fleet reduction an unlikely explanation. For Limmatalbahn, the explanation is indeed credible. The article also says the electrification of routes 69 and 80 is still a possibility. The delivery of the new Bombardier trams will radically change the face of Basel's tram fleet, so friends of the classic trams, enjoy them while you can. Besides the elimination of the Swiss Standard Trams (457-476) of 1968-1968, the articulated units 659-686 will also go (these were fitted with rather unsuccessful and unaestheitical low-floor middle sections in 1997-1999). Apparently Sofia is interested in acquiring these. The Cornichons 477-502 will probably be retained as reserve units, as will some trailers. 462 has become the first of its batch to be withdrawn, following a fire. Furthermore, it appears that a pair of Duewags can be retained as museum set. 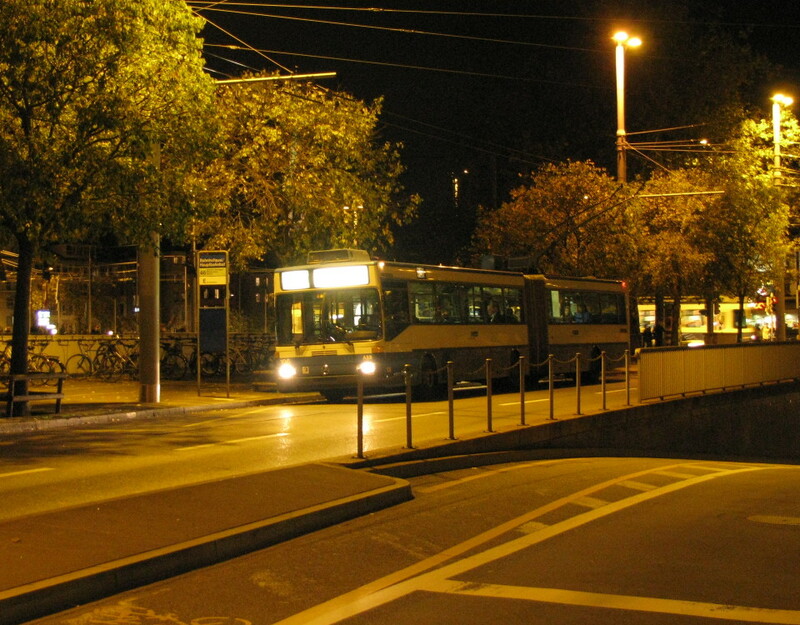 During the debate preceding the 2008 closure of Basel's trolleybus, it was argued that the new gas buses were just as clean and quiet as the trolleybuses they were prematurely replacing. Making a quiet U-turn on its earlier intentions of having an all gas-bus fleet, it appears BVB is once again seeking to acquire diesel buses. So much for referendum promises. In the meantime, with sufficient Tango trams available, BLT is proceeding with reverting some of its Be4/8 (of the 201 to 266 series) to Be4/6 by removing the low-floor sections so they can take on the duties of the older (and shorter) Be4/6 units. BLT is also apparently now considering acquiring Bombardier Flexities rather than further tangos. The availability of the new double-articulated trolleybuses 78-89 has been somewhat problematic during their first months. The reason for this was that, in contrast to the earlier batch (61-77) which has auxiliary diesel motors for moving away from the wires, the new units had lithium batteries, the charging cuits of which have not always behaved as expected. Consequently, the subsequent delivery of Swisstrolley4 single-articulated buses has been delayed. The first unit should have been delivered at the end of last year but so far none have yet been seen in Zürich. Several corresponents has pointed out to me that I have mistaken the identity of the tram damaged by fire at Escher-Wyss-Platz depot. The tram was Cobra 3034, not 3043. Investigation of the damage to Cobra 3043 shows that a repair is viable, but the tram will not return to service before the Summer at the earliest. Forensic investigations indicated that the fire was arson. Part of the storyline of the 2002 movie, The Bourne Identity, plays in Zürich, only the Zürich of the movie wasn't Zürich but Prague (apparently Hollywood decided that Zürich didn't look enough like Zürich – or maybe it was just too expensive). Tram enthusiasts who watched the movie will not have missed the cameo appearance by some Zürich trams. These were actually Tatra T3s repainted into VBZ livery. Some rare (non movie) footage of these units has appeared on YouTube. Note the mis-spalling of O[e]rlikon. I guess these Tatras were supposed to resemble Karpfen units, with both fleet numbers and routes being correct for the period. 11.01.2013 - Which shade of green for Basel? 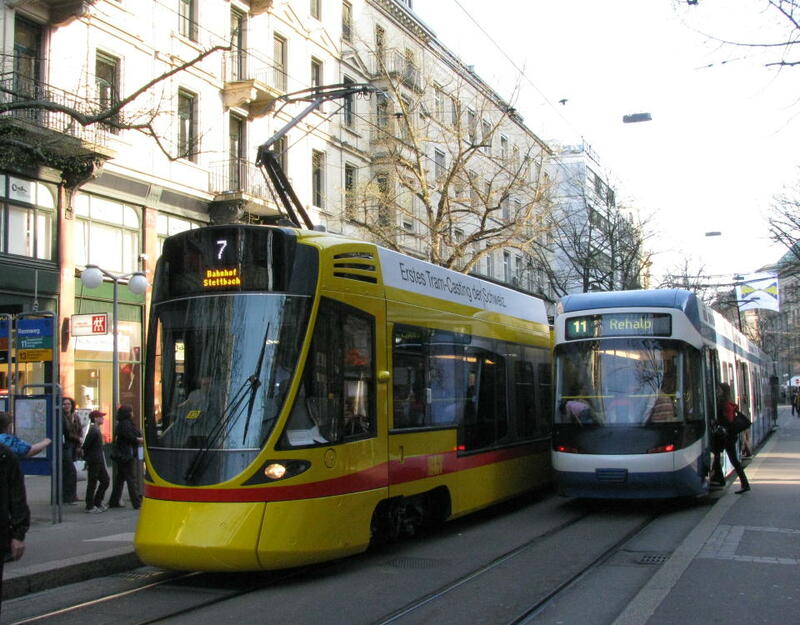 Basel is consulting its citizens over the shade of green in which its trams should be painted. The consultation is taking place as part of the acquisition of 60 new Flexity trams, the first of which will arrive next year. A Combino tram has been painted into four different variants, with the public being asked to select their favourite. 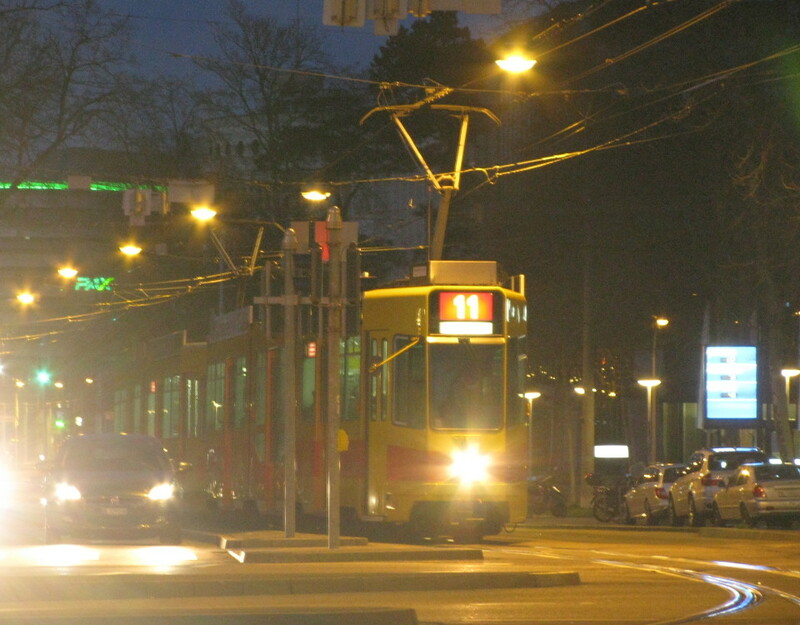 Basel's trams have been green since the very beginning in 1895, but the precise shade has developed over the years. The latest incarnation of this, as applied to the Combino trams, was not broadly appreciated, and at times described as "poison green" (Giftgrün). For those who haven't visited google.co.uk today, the welcome screen marks the 150th anniversary of London Underground. 150 years ago today, the first underground train operated between Paddington and Farringdon. 07.01.2013 - Is burnt Cobra beyond repair? Cobra 3043, which was damaged by fire last Wednesday, is currently being assessed in the VBZ workshops at Altstetten. Whether or not the aluminium structure can be salavaged depends on the temperatures to which it was exposed during the fire. 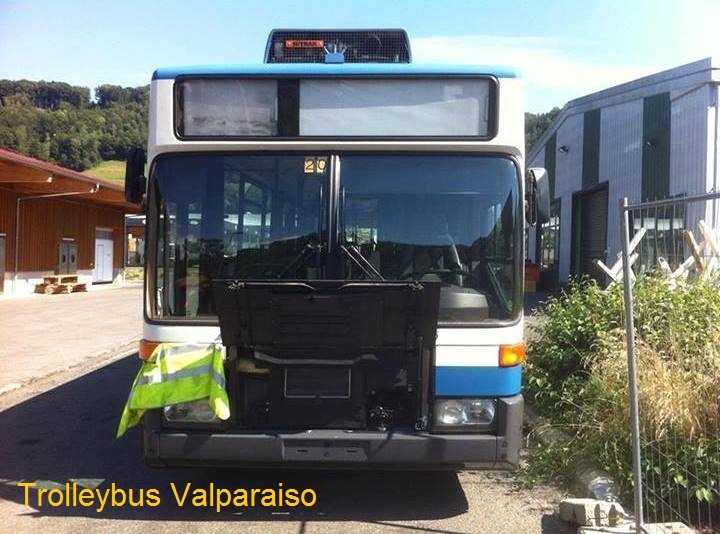 It has already been revealed that segments 2 and 3 are beyond repair, and that VBZ does not have the parts in its own inventory to build replacements. It thus remains to be seen whether these parts can be sourced at an acceptable cost. As an alternative the approaching new tram order could be increased by one unit. VBZ has rejected speculations that the Cobra could be rebuilt as a three-section mini tram. Tram 3043, which was damaged by fire at Escher-Wyss depot on Wednesday was moved to VBZ's Altsetten works by low loader lorry this morning. Following up on the recent item on the 1953 visit of two RT buses to Zürich, I have discovered this fascinating Flickr page collecting pictures of this and other worldwide goodwill visits by London buses. The RTs almost literally went to the four corners of the Earth, including a phenomenal 12,000 mile tour of the USA and Canada by three of them in 1952 (without any failures) making the road trip to and through Switzerland seem a home game in comparison. The picture above, taken from that photo stream, shows the two Zürich-bound buses (RTL1459 and RT3710) crossing Putney Bridge at the start of their minor odyssey. The stream includes several other shots taken during this tour. In later years, the RMs were to continue the tradition of goodwill tours for a while, but closer to date similar activities by Fleetlines, Metrobuses and Citaros were to become far scarcer (to put it mildly). Maybe it was because goodwill (or even buses) fell out of fashion in a globalised and rationalised world. Or maybe it was because a mass-produced and interchangeable bus can hardly be an ambassador of any city. Let us see whether Boris Johnson's revival of the true London bus will help reverse that trend. The visitor counter on the newslog page has just passed the 100,000 mark. Thank you to all loyal (and occasional) readers who continue to make this site popular. Yesterday night a fire broke out in the yard behind Escher-Wyss-Platz depot. Cobra tram 3043 suffered damage along with two automobiles that were parked adjacently. The fire was discovered at 3am and extinguished by the fire brigade. The extent of the damage and the cause are not presently clear, with a scrapping of the 3.5 million Franc tram being a possible consequence. All 2012 news items can now be found on www.proaktiva.ch/tram/zurich/newslog/2012.html.